Preplanning gives you time to think about what you want and make decisions with a clear mind and purpose. More Americans are prearranging their funerals and cremations than ever before. 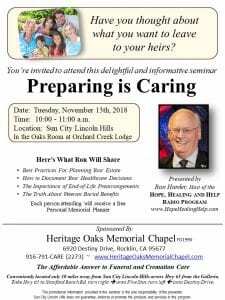 Call us at 916.791.2273 to register for our upcoming Preparing Is Caring Seminar at Sun City Lincoln Hills on November 13th at 10:00 in the Oaks Room at the Lodge. Who will arrange my funeral if something happened to me tomorrow? Who will have to pay for my funeral? How much should I spend on my funeral? In most cases, you can pre-fund your arrangements. Pre-funding will protect your family against inflation by locking in today’s cost. We offer a free cost estimate and information about the variety of prearrangement options available. We can set an appointment at our office or in your home, at a time that is convenient for you. Call us at 916.791.CARE (2273) today to schedule your pre-arrangement meeting. To express your own wishes. May people find value in planning a funeral that reflects their personality, interests and life’s work. Advance funeral planning ensures that your exact wishes are fulfilled and gives you time to discuss these wishes with your family. Relieve a financial burden. By funding your pre-arrangement today, your survivors won’t need to bear the financial responsibility. Your life insurance and other assets can remain intact because you can dedicate money specifically for the cost of your funeral. Relieve an emotional burden. It’s difficult to think about one’s own funeral. But think how difficult these decisions would be while grieving for a loved one. Your advance funeral plan can include every detail from the service to the casket, music, flowers, and more. Funerals provide a time of healing for your family. By planing ahead of time, they can come together to share their loss and appreciate your final farewell. Call us at 916.791.2273 for time and location of our next Preparing Is Caring Seminar. This seminar is light hearted and educational about a subject that is often difficult to discuss. We’ll answer your questions. Plus, you’ll receive a complimentary Personal Memorial Planner to get you started recording very important information for your estate and final plans. What is a Personal Memorial Planner? We have created a very helpful booklet that provides space for you to record important information about you, your family, location of financial records and trust or will. Receive your complimentary Personal Memorial Planner at one of our seminars. Or stop by and pick one up. When you do, we’ll treat you to a cup of coffee and take you on a tour of our facility. Why Are Pre-Arrangements are Important? We place our pre-arrangement insurance policies with Homesteaders Life Company, the leader in the industry. If you enjoy traveling, ask your Prearrangement Counselor about Return Assured. You’ll want to know about this product if you enjoy traveling.